Sold, For Sale, or Open for Inspection? 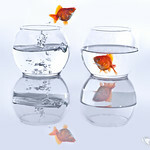 Perhaps goldfish need to keep outgrowing their fishbowls in order to reach their maximum potential? Yes indeed! Thanks for the feedback…but…..just how big can a goldfish get? A goldfish-whale!? OK….I’m sure that the Goldfish will be very large by the time it swims all that way to the Northern Hemisphere! Hmmmmmmm – a very poignant point – I think can relate to the fishbowl situation.! !